Are you a woman working in the drone industry, or want to work in it? Here are 6 mighty actions you can take to learn, share experiences, and get inspired! At least once in our lives, each of us has let an opportunity pass to do something exciting because of self-doubt, shyness, not wanting to be judged or fear of failing, especially if you are a girl and especially if we talk technology, which for decades was considered to be a ‘boy thing’. Drones are new, utterly exciting, quickly evolving and – gender neutral! When we talk drones, we firmly believe that drone tech and femininity are not mutually exclusive. I have put together a small but mighty list of actions for girls and ladies out there, who are either starting out in this amazing and rapidly evolving drone world and could do with some support, advice, and inspiration, or are professionals looking to expand their network or provide support. 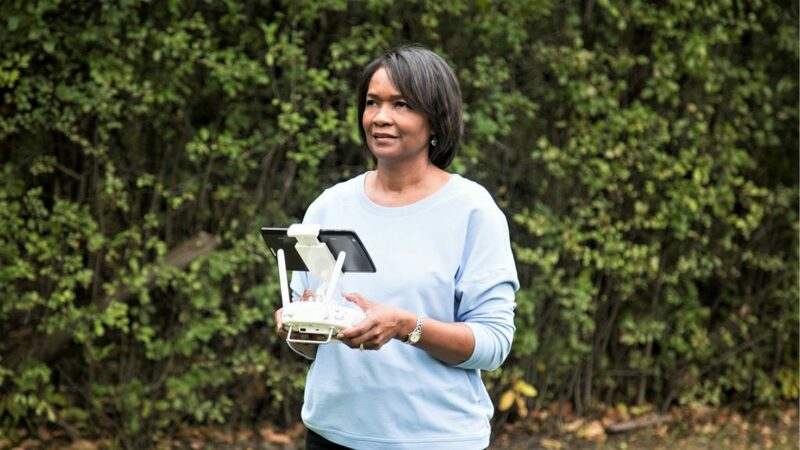 Women & Drones, founded by AeroVista Innovations COO Sharon Rossmark, aims at inspiring, encouraging and promoting women in drones, and is an excellent source for great interviews with female experts, influencers and role models in this innovative industry. One of the recently featured ladies is our very own Skytango co-founder Susan Talbot – a fierce advocate for girls in STEM, breaking the stereotypes and rules, and successfully managing entrepreneurship and family life. You can read Women & Drones‘ interview with Susan here. You can also check out our interview with Sharon Rossmark on the vision behind Women And Drones. 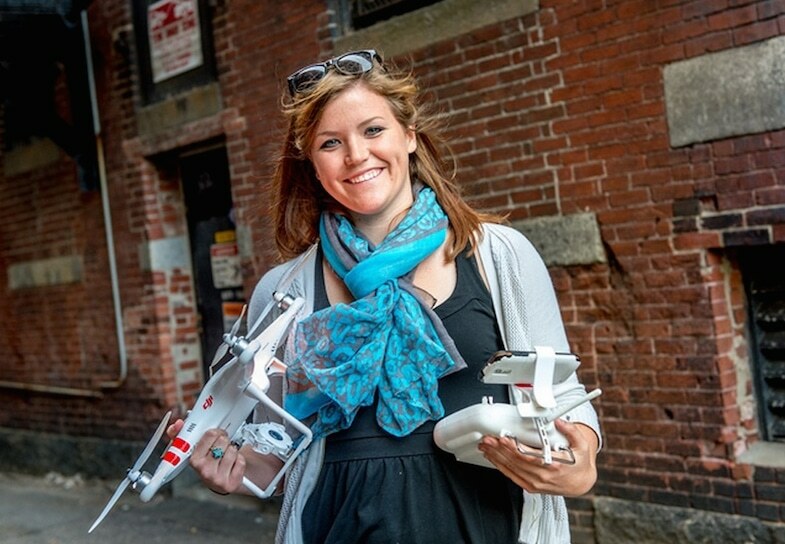 Amelia Dronehart is a great resource for women in drones. 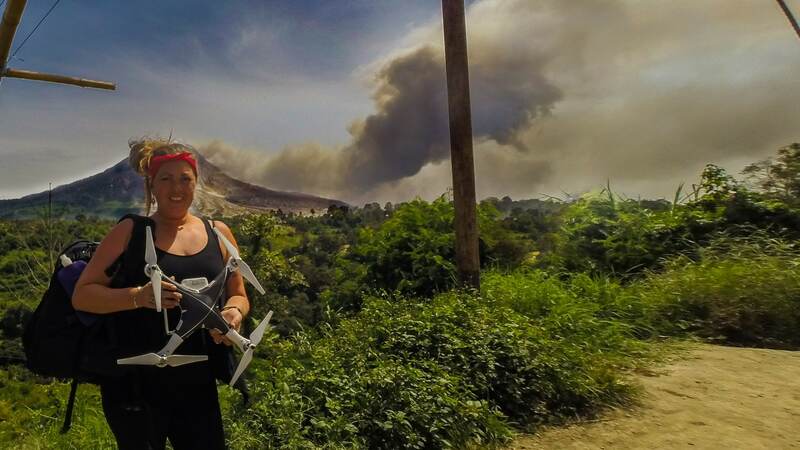 It’s a worldwide online community for female remote control pilots and drone enthusiasts, founded in 2014 by Rhianna Lakin (read more in Rhianna’s interview with Sally French). The Amelia Dronehart website features news, events and new products for women who fly, but the core of the community is in the Amelia Dronehart Facebook group, which is particularly active with over 400 members sharing experiences, collaborating and building friendships. Members of the Amelia Dronehart community promoted the active participation of women in drones in the recent International Drone Day 2017. 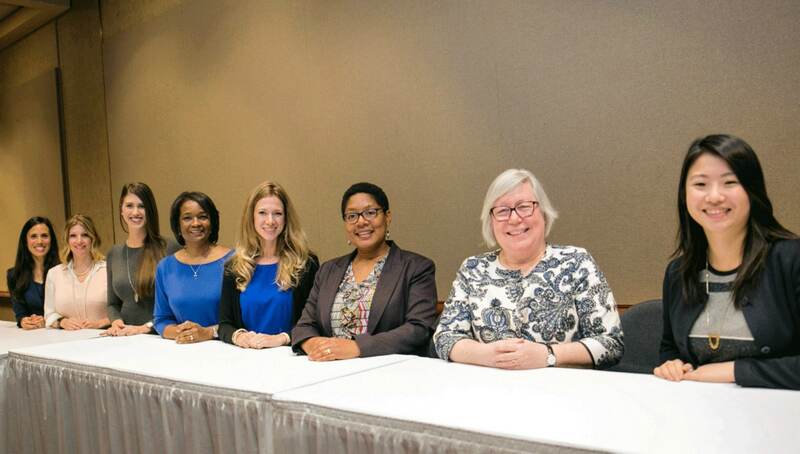 Women of Commercial Drones was born as a meetup in December 2015, and then it grew to become a more formal organization in August 2016, supporting women interested in pursuing careers in a commercial drone enterprise market. The founding members of Women of Commercial Drones are three renowned ladies: Gretchen West (Senior Advisor at Hogan Lovells, and a member of the firm’s Global UAS Group in Silicon Valley), Lisa Ellman (Partner at Hogan Lovells, Chair of the firm’s global Unmanned Aircraft Systems Practice Group and Co-Executive Director of the newly launched Commercial Drone Alliance) and Dyan Gibbens (founder and CEO of Trumbull Unmanned – a Forbes Top 25 Veteran-Founded company, focusing on data processing and UAS integration for the energy sector). 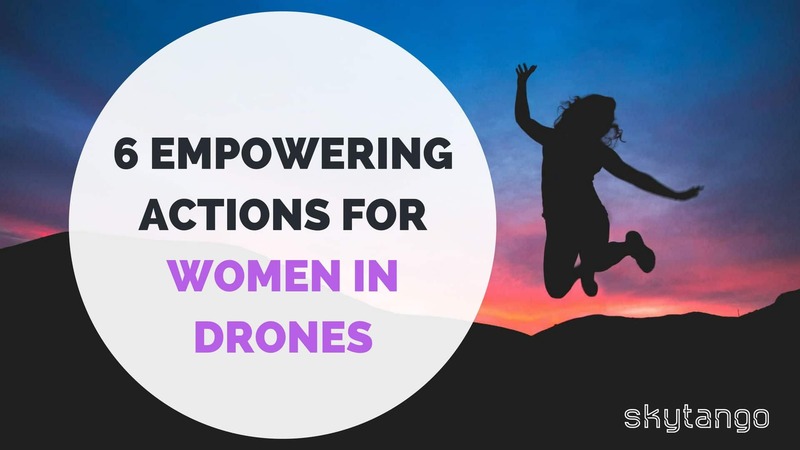 In addition to organizing external initiatives to support the growth of women in the industry, Women of Commercial Drones also provides another platform for female drone professionals to discuss challenges, share achievements, collaborate and support each other. At the moment membership is under construction, but you can get in touch through their contact form and stay tuned for updates! The Commercial UAV Expo, one of the most important B2B drone events, launched the Women in Drones Group on Linkedin a few years ago, which offers another platform to connect with other women in drones and engage in conversations around the industry. The group has over 100 members and it welcomes new members. SheFlies is an Australia-based programme which aims at promoting gender equality in STEM, generating a conversation around it, encouraging, inspiring and providing learning opportunities to girls and women through drone education. SheFlies offers comprehensive and multidisciplinary programs for schools, community groups and businesses, with a goal to build confidence of girls and women to engage in the amazing drone world, from aerial filming, to drone racing and engineering. Two remarkable ladies behind SheFlies are co-founders Dr. Catherine Ball (PhD Spatial Ecology) and Dr. Karen Joyce (PhD Geographical Sciences). Catherine Ball is an author and ethic advocate working across global projects where robotics and new technology meet environmental protection. Catherine has plenty of well deserved awards under her belt – Queensland Telstra Business Women’s Awards Winner 2015, Top 25 Women In Robotics 2016, Westpac 100 Women of Influence 2016 are only a few out of many. Karen Joyce has been working with remote sensing and earth observation for nearly two decades across academia, industry, military and government roles. She is also a certified remote pilot with experience spanning micro drones and heavy lift rotory craft up to 35kg. SheFlies is not the only programme using drones as a main STEM tool. For example, the Atlanta-based non-profit organization Kids Drone Zone, founded and run by Jacquene Curlee, has worked with over 6,300 students in Georgia, USA teaching them how to build a drone, code a drone, and how to fly a drone, since August of 2014. Another similar program, running nationwide across the United States for the past 2 years, is UAS4STEM, created by AMA (Academy of Model Aeronautics). Again, two women are involved in its management, Julie Bladen (AMA Education Specialist) and Jessica Symmes (AMA Coordinator of Educational Programs). SheFlies is the only programme though, as far as I know, which has a specific focus on girls’ education and empowerment. If you know other programmes with this focus, let me know by leaving a comment! Many of the B2B commercial drone events feature not only excellent female speakers, but also special panels and networking initiatives dedicated specifically to women in the industry. Women of Commercial Drones Networking Breakfast at Drone World Expo, Women in Drones Luncheon at Interdrone, Women in Drones Breakfast at International Drone Expo, Women in Drones Luncheon at Commercial UAV Expo, Women in Drones at Drones Africa Summit, Women and Diversity in Robotics at AUVSI are just a few examples. Most of the top B2B drone events offer opportunities to network with other women involved in the industry. Stay on track with what’s happening around the globe by checking our regularly updated comprehensive list of top commercial drone events. If you are based in the United States, check out DARTdrones – one of the leading drone training schools, founded by Abby Speicher. They offer training courses, consultations and expert support throughout the United States. DARTdrones team include Amelia Owre, Director of Training and U.S. Navy aviator who created UAS training programs for the Navy, and excellent female drone instructors like Christina Martinez (majors in Commercial Aviation and Air Traffic Control) and Becky Hagner, who is also a Mission Manager for NASA’s Sounding Rockets Program. There are plenty of truly amazing drone geek girls that are worth following online or meeting at drone events. The more I investigate, the more I discover how much women are contributing to the development of the industry. One of my role models is Zoe Stumbaugh – the top FPV drone racer in the United States. This awesome girl builds drones, is an active test pilot, VR enthusiast and creator of ‘Test Flight with Zoe FPV’’ and the brand new Dronelicious Show on YouTube. Another two women I admire are Helen Greiner and Christina Engh. Helen Greiner is a robot enthusiast (iRobot co-founder), former employee of Laboratories in NASA & MIT, and founder of drone technology development company CyPhy Works. Christina Engh is an Army Reserve Blackhawk pilot, Brigade UAS advisor and Co-founder & COO of UASolutions Group – a female disabled veteran-owned small business providing affordable innovative solutions to safe and efficient UAS integration. Former FAA UAS Integration Office employee, this fascinating lady now eats, drinks, breathes, sells & advises on all thing drones. There are drone technology engineers like Valentina Russo, who builds drones for geomatics and photogrammetry, or Natalie Cheung, Intel’s UAV Product Manager and one of the top company people; teachers like Loretta Alkalay, who has been a FAA lawyer for 30 years and is now adjunct professor at Vaughn College of Aeronautic Engineering, Aviation, and Technology, teaching aviation and UAV to college students; researchers like Robbie Hood, Director of the Unmanned Aircraft Systems (UAS) Program at NOAA (National Oceanic and Atmospheric Administration) where she manages a budget of $5 million per year to use drones for mapping of coastal erosion, studying sea level changes, populations of fisheries and marine mammals, and monitoring weather conditions. There are online journalists like Sally French, who writes on drones for MarketWatch and on her popular blog The Drone Girl, Lauren Sigfusson, editor at Drone360, Miriam McNabb, writing on current drone news, financial trends, and FAA regulations at DroneLife, or Betsy Lillian, editor of Unmanned Aerial Online since 2014; TV producers like Maria Stefanopoulos, Emmy Award winning Production Manager at ABC News and Good Morning America. There are artists like Laure Muller-Feuga, award-winning director and aerial filmmaker (check our interview with Laure on the making of Snowglobe), Kara Murphy, a Drone360 contributor who has built a great audience on social media with her aerial shots, moving her flying hobby to a pro level in a short amount of time, or Laurie Rubin, Smithsonian featured nature photographer and DJI Pilot of the Month, who uses drones to film nature and wildlife. There are professionals in executive roles like Lia Reich, VP of Marketing & Communications at PrecisionHawk (check her interview with Jeremiah Karpowicz on the value of connecting and collaborating with other women); pioneers like Judith Sherman, Chief of HIV/AIDS, UNICEF Malawi, who spearheaded UNICEF’s drone programma in Malawi for humanitarian purposes, using drones in the health supply management and for emergency responses. The list of women in drones who are hugely contributing to the industry could go on and on, and someday your name might be on it, if you put aside your fear, do what you love and put all your heart into it!